Big White has tons of terrain, almost 1,000 acres in bounds, over 2,765 total, which sprawls across miles with a progression of difficulty, East to West, or skiers’ left to right. Well placed lifts, 15, mostly new, with a few oldie but goodies – the Alpine T-bar for example, deliver skiers to over 118 trails. Happy Valley and Black Forest areas offer easier runs and mellow glades to the East. The Telus Terrain Park Chair, Bullet, Snow Ghost and Ridge Run Expresses are legendary for “cruizin the bluz” groomers. Personal Big White favorite trails: Perfection and Paradise. The upper mountain Cliff Chair, Alpine T-Bar, Powder Chair, and Falcon serve more natural gutsy terrain, snowfields, and snow ghosted glades, though there is a groomed green run off each lift. Skier’s right are the longest runs. Our fave is the undulating, wide, scenic 2.5-mile Blue Sapphire, a full 2,500’ vertical with sweeping turns to the remote Gem Lake Quad for a long 2,300’ vert quad ride back up. Some say Big White is Flat White, but hike out from the Cliff Chair to Parachute Bowl and you’ll dispute that claim, there’s challenge at the Cliffs and the glades of Falcon and Powder Chair peppered between prepared runs. Big White is natural snow reliant, only snowmaking is in the terrain park, so go Big on a powder day. With a nickname of Big Whiteout, this place gets snowstorms, evidenced by the snow ghosts, and its share of Pac North West dumps. Après ski at Big White, take the kids tubing, get drinks on the deck at Snowshoe Sam’s or The Woods, or just head to the roof top hot tub to watch the Alpen glow over the Okanagan valley. Don’t forget there’s night skiing, western Canada’s largest lit ski terrain on weekends and holidays. Dinner at The Blarney Stone – Canada’s highest elevation Irish owned pub has great views of the valley and live craic certain nights. Snowshow Sam’s also brings in live music weekends. Big White is global, host to as many Australians as Canadians. Canada’s “favorite family ski resort” is actually Ausie owned since 1994 and the staff and vacationers alike are friendly, fun and from down under. 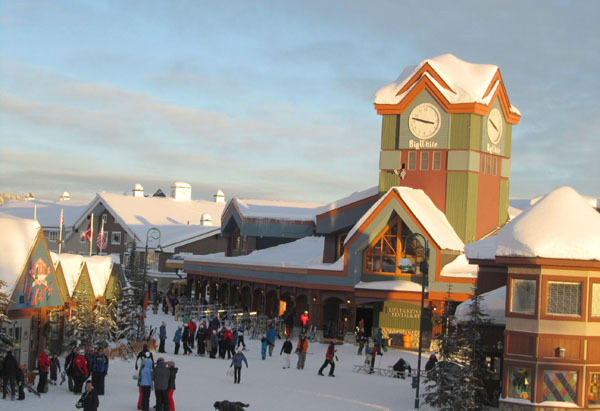 Take your family to Big White for a big white ski holiday, it makes our Top 10 Canadian ski resorts for family skiing. Kids in ski school get a snow flake GPS that tracks their laps, parents can log in and download their child’s day of runs – how fun is that?! Big White is big fun, your family will big love it!